This will only change the default behavior of that specific file. Going one step beyond a single file association, you can change the default app of all of the chosen files format by being at the same Get Info window, selecting then app, then click on the “Change All” button. 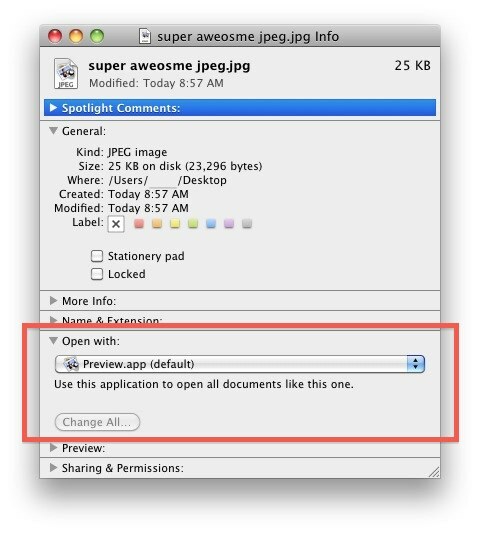 This lets you assign something like Preview to always open all PNG files, for example. Do note that if you click the “Change All” button you will change that file types association across Mac OS X, causing all instances of that file format to open in the application you chose. Even after that has been enacted however, you can still override it on a file-by-file basis by using the aforementioned Get Info trick to alter the relationship between that single file and a given application. Haters gotta hate man. Thanks a lot from me though. This has been driving me nuts! I appreciate the help!